Luxurious Designer Home | Pet-Friendly 4 BR w/ 2 Masters & Outdoor Fireplace! The Perfect Vacation Spot in WaterColor + Bring Your Pets! This beautifully designed four bedroom, pet-friendly home located in the Lake District of WaterColor offers all the extras of you could want. The open floor plan, an outdoor fireplace, and luxurious master suite are all amazing features of this property. 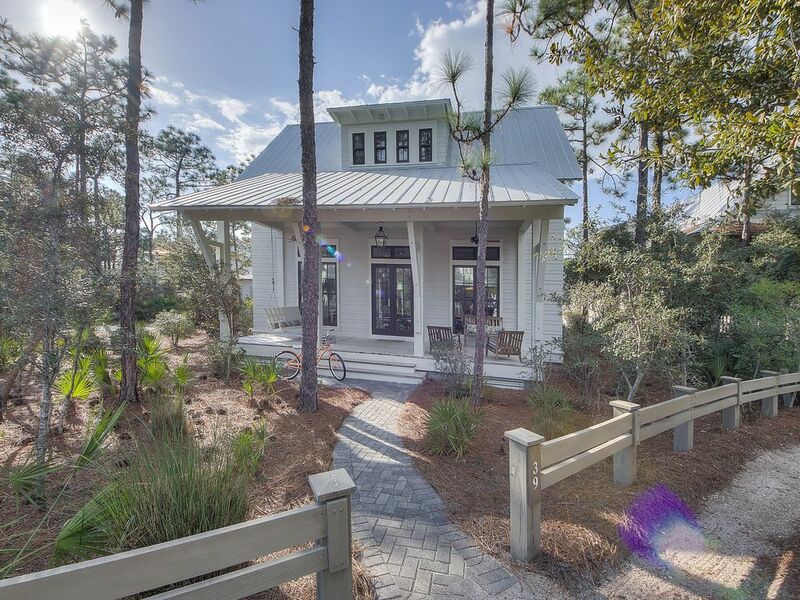 The location is only steps from the “Frog Pool,” and this home offers guests easy access to the beach and the Beach Club via the Western Lake Bridge. The family room, dining room, gourmet kitchen are all located on the first floor along with Master Suite. The kitchen features a Dacor stove with steel griddle and Dacor oven, Dacor Refrigerator, standalone ice maker, dishwasher, wine refrigerator and beautiful granite counter tops. The screened porch features a fireplace, perfect for a cool morning or afternoon, and plenty of seating and a patio table. The master suite has a king bed and full private bathroom. Master bath has a walk-in shower and double vanities. Entering the second floor you will find a cozy sitting area with a set of built in twin bunk beds. There are three additional bedrooms located on the second floor. The first guest room (second Master Suite) has a king size bed with private bath and large walk-in shower, the second guest room has two twin beds with a private bath, and the third guest room has two twin beds. All bedrooms are equipped with televisions. This home is perfect for entertaining guests or just simply to relax. the prior reviews for this house were spot on. We had a total of 6 people in our party with more than enough room. nice open floor plan made it nice for entertaining. wonderful home and location. def recommend. Thank you so much for choosing to stay with us at Sanders Beach Rentals. We are so happy to hear that you enjoyed the lovely 39 Bluestem and the location. Thank you so much for recommending the home. We would love for you to visit us again soon! Great house in a great section of Watercolor. The house itself was great, but a few little things got in the way. Upon arrival, the code for the door didn't work. I think it was Jennifer who eventually got us in. Similarly, the modem or router for wifi didn't work - a call from tech support helped get it settled. Then, the left sink in the master bedroom didn't drain. When we realized it, we just didn't use it. This is our third Christmas in Watercolor, and we're stilled baffled by the lack of recycling opportunities (for boxes, packaging, etc.). All that said, we loved the house and the ability to bring our two dogs. Hopefully, we'll be back in the future. We are so glad to have you stay with us in Watercolor and to enjoy the lovely home at 39 Bluestem. We are so glad you liked it especially for it being pet friendly for your use. Thank you for letting us know about the sink. We will certainly get it addressed. We thank you for your input and opinion on recycling in Watercolor. This is an area of authority that falls under the HOA of Watercolor. Again, we are so happy you enjoyed the home and we look forward to having you back with us in the future. The house was perfect for our family. I loved the fact that we could bring our dog. She is 10 years old and only weighs 3 pounds so we hate to board her. When I saw the house was pet friendly it was a no brainer! Connie at Sanders Beach Rentals was so nice and accommodating. I will definitely rent from them again. We are so thrilled the house was perfect for your family vacation! Thank you so much for choosing to stay with us at Sanders Beach Rentals for your vacation. Please come back any time! We will be here to help! The house is much bigger in person than it appears in the photos. We had two families of 4 and had more than enough room. The location is perfect, in a quiet area that is within easy biking distance of the beach, Beach Club and Seaside. The house was exceptionally clean. Not a spec of sand anywhere. We had trouble with the code upon arrival, but called Sanders and were inside within a couple of minutes. This was our 2nd stay in a Sanders property in Watercolor and we will be back for sure! Thank you so much for choosing to stay with us at Sanders Beach Rentals for your vacation. We are all so thrilled that you enjoyed the location and that the home worked well for you and your group! We would love to have you back down on 30-A soon! We truly appreciate the feedback from your experience with us. great house and quiet location! We are so glad you love the location and the home! Thank you so much for choosing to stay with us at Sanders Beach Rentals for your vacation. We would love to have you back down on 30-A soon! We are so thrilled you enjoy the beautiful 39 Bluesteam! Thank you for trusting Sanders Beach Rentals with your vacation. We truly appreciate the feedback from your experience with us. Instant Quote Does Not Include Pet Fee ($250 Per Pet).